Programs: Any program with a credit card, or good prices. Of the people cycling money with FFcc's to Paypal then to your bank. I sure hope that this doesn't imply that people are sticking Kiva (a charity) with the paypal fee in and out? It doesn't happen too often but there is always the chance that you will get stuck. 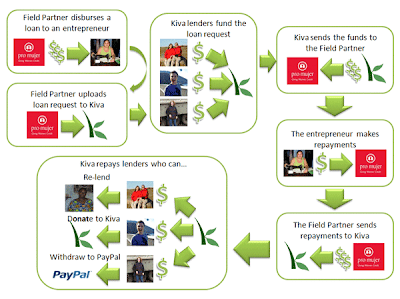 From the kiva.org website- "Current repayment rate (all partners): 98.57% "
I will be signing up for the FT team and making a loan or two in the next week. Glad I saw this thread, as I didn't realize there was a FT team. I've been lending to Kiva for years, but never knew about teams at all, let alone this one! Just joined -- looks like there are now 131 of us. Bikeguy and dliesse, welcome to the team! Credits are starting to post from Kiva's net billing process on the 15th. It runs alphabetically - still in the early part now. I'll be able to add a few more loans to the FT team. Thanks for the reminder, Wildblue! Two more loans for the team. I'm about to (finally) join up with the FT team. On the Kiva signup page, it asks for "Referred by a friend?" If it creates any good benefits or other karma points for the FT team (or an FTer), PM me with an email and I'll include that. A much wider than normal spread of dates the credits rolled into my account this time. One loan that had been delinquent for a couple of months has resumed repayments (although still behind). FT team is moving steadily towards $40k lent. I joined tonight. Happy to be a small part of this wonderful work. I'll be doing some research (so many loan possibilities !) before making my first loan. It's fun, and it surely makes a difference! What a great way to actually enable (in a good way) people in countries we have travelled or may have special interest in! I made my first loans on Friday, and will make more soon. I'm glad to see this good work growing.